I think this would be a perfect thing to serve at your fancy, aphrodisiac-laced, love-feast on Valentine's Day. You'll be sure to impress your special guy or gal and get yourselves in the mood for the rest of the night (the coffee will give you a little necessary after-dinner energy, if you know what I mean, wink, wink). I love this recipe because it combines the post-dinner coffee with the dessert into one, glorious union. The flaky, crunchy, bittersweet ice crystals are an amazing texture served alongside velvety whipping cream. AND it is a beautiful presentation. AND it's easy. AND you can make it ahead...so really, it's kind of the ultimate dessert. While hot, stir sugar into coffee until dissolved. Cool to room temperature. Add the cinnamon & stir. Pour coffee mixture into a 8 x 8 inch baking pan - glass, ceramic or metal will all do. Place in freezer. After about 30 minutes, or when ice crystals start to form on the edges of your pan, scrape the mixture with the tines of a fork. Return to freezer. Continue stirring every 30 minutes, scraping & breaking up ice crystals with your fork. After about 3 hours, you should have a fluffy pile of coffee-infused, caramel-colored icy deliciousness. (see video below if you are having a hard time visualizing the scraping process) Keep in freezer until ready to serve. Just before serving, whip the cream until slightly thickened and soupy. Sprinkle in sugar and add vanilla. Continue whipping until soft peaks form. 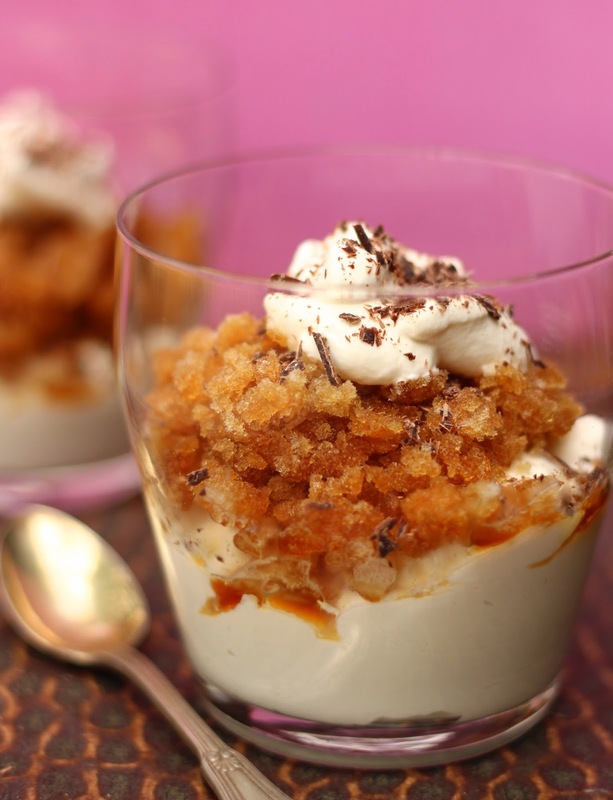 To serve: place a large spoonful of whipped cream in the bottom of a dessert glass. Top with a generous scoop of granita. Add another small spoonful of whipped cream on top for a pretty layered effect. Top with dark chocolate shavings.